FOR a trendy stay while visiting the historic U.S. capital, consider the Aloft National Harbor or Aloft Dulles North hotels. The hotel chainÃ¢â‚¬â„¢s core values are sassy, savvy and space. Sassy stands as a contrast to stuffy hotels. Savvy is because all the hotel staff (not just the bell captain or concierge) are knowledgeable of the hotel and city. Space? Well, the hotelÃ¢â‚¬â„¢s public areas are just that: extremely spacious and not cramped. The hotel chain provides incentives to join in its sustainability practices. Guests who skip everyday room cleaning receive $5 towards the Re-Fuel station (food) or Starwood points. If you need a little extra motivation while on the go, stop by the Re:charge 24/7 fitness center and download easy-to-execute a-workouts onto your laptop, iPod, iPhone, Blackberry, Treo or other handheld device. 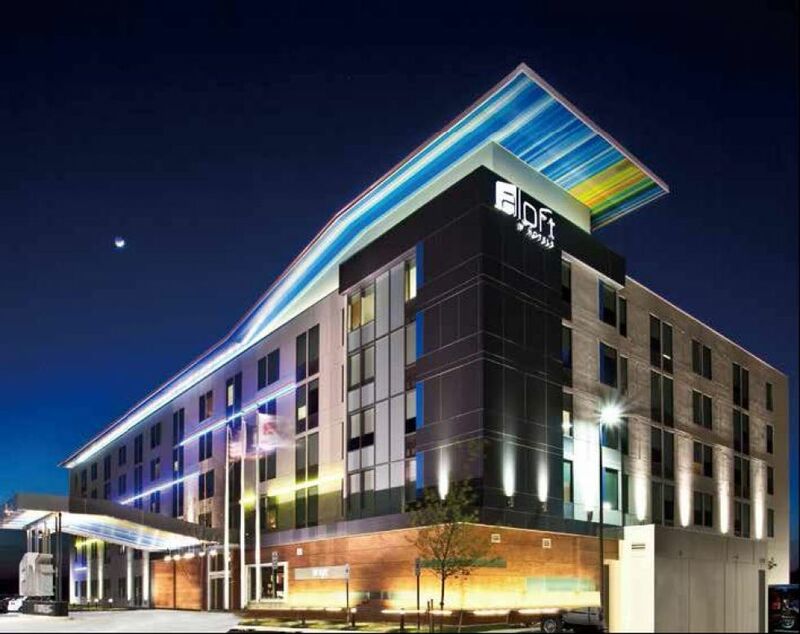 MINUTES away from Washington, D.C. and Old Town Alexandria,the Aloft National Harbor is close to three major airports. The location provides access to thre different worlds: the the charm of historical Old Town Alexandria, the excitement of the sights and sounds of the nationÃ¢â‚¬â„¢s capital, and the relaxing hominess of the harbor and its shops, where thereÃ¢â‚¬â„¢s a real feel of community. After a cab ride through the city, I crossed over the bridge into a totally different kind of area Ã¢â‚¬â€œ beautiful and set apart. When I entered the hotel I expected it would be the traditional fare of any vacation destination. Instead, I was greeted with a trendy urban feel. The entrance into the hotel is a very small and bare area containing rather generic couches and an elevator (or stairs, if you prefer) to take you up to the main lobby. When the elevator doors open on the main lobby floor, you are greeted by an Ã¢â‚¬Å“industrial-chicÃ¢â‚¬Â interior design that combines cement floors with stylish but comfortable chairs and sofas with funky pillows. In our technology-driven, Google-it-yourself world, the first things that caught my eye were the lobby iPads that can answer many of your questions. This hotel may not be for the traveler who expects a traditional concierge, bellhop and so forth. Many aspects of the hotel are self-serve. But what was traditional to me was the smile and welcoming spirit of the front desk staff. Part of Starwood Hotels & Resorts, the Aloft National Harbor was the fifth Aloft Hotel opened in the U.S. and has 190 rooms, two small meeting rooms and a and shops. The innovative architecture with open rooms and high ceilings is a welcome change for the business traveler. Rooms all have free (and fast!) Wi-Fi as well as Ethernet cables. As this Aloft hotel is on the harbor, it enjoys a special relationship with boaters. It is a place where everybody knows your name. Regulars of the lobby bar are allowed to use the amenities (pool, fitness) at special rates. The National Harbor Aloft piloted the chainÃ¢â‚¬â„¢s Ã¢â‚¬Å“Grab & GoÃ¢â‚¬Â breakfast where you fill out a reservation card by midnight and your breakfast is ready for you in the morning.